I’ve just been accumulating a list of awesome things and annoying things that I’ve noticed lately. Especially now, with the house next door on the market, strangers often park in front of our house. I don’t mind that. I welcome a new family. What I hate is when they choose to park with their entire passenger-side wheels on the grass. They are scootching way, way over for no reason at all. Our road is wide enough for full two cars to drive side-by-side on the pavement (even though they are not supposed to do that, I have seen it done). They are parking that way on the off chance that a terrible driver sideswipes them, thinking that maybe six or eight inches will make a difference. The chances of both of these things happening is very, very small. But if they compact my grass by parking on it, they will absolutely, definitely make my lawn look crappier. If anyone was wondering why there’s a cinder block there right now, it is a booby trap/deterrent. And if you think that you need to point out the irony of trying to prevent the crappy-ification of my lawn by putting a crappy cinder block on the edge of it, well, you actually don’t need to do that, thanks. J’s band and chorus concert was the other night, and this couple behind me kept talking, and by “talking” I mean talking and not whispering, in the middle of almost every song by every group. Sometimes the man was punching at a phone while talking to his companion. I gave him the kind of look that would shut up any–well, I was trying to come up with an adjective for adult (intelligent? halfway-cognizant? self-respecting? ), but I think that I mean that I would have expected literally any adult would shut up when confronted with my steely glare. Not these two. Even Cute W, who is much more patient than I am, gave a couple of pointed stares. It is situations like this that demonstrate how important it is to disallow people from concealing and carrying weapons, because if I’d had a gun, I probably would have shot that guy. I mean, what kind of person can talk right through a fifth grade band playing the Star Wars theme song? Someone who should probably get shot in the face. I know that’s wrong. And that’s why it’s best if I don’t have access to firearms. Sometimes I watch shows or read books and think, “Wait, was whoever made this story up on drugs at the time? Is getting high the only way to truly connect with this plot and these characters? Or am I just unbelievably lame?” And either way, whether it’s because I should be actively high while watching it or because I just need to be less lame, it makes me think that I should have been the type of person who did more drugs instead of just the teensiest, dip-your-toe-in-the-water experiences, but now I am 45 and it just seems like that ship has sailed and I will have to remain disconnected from some pop culture forever and ever. Speaking of pop culture, you know that song, “7 Years” by Lukas Graham, where he sings about how “Soon we’ll be thirty years old”? I feel like, every time I hear that song, it actually ages me. Like, I understand that every minute that I’m alive I’m aging by a minute. I mean, I’m resigned to that. But when that song is playing? I really feel myself actively aging. Like it’s dog years or something. Which is why I switch radio stations every damn time. The guys attempting to flip our neighbor’s house decided that they would attempt to transform our “shared” driveway into an “adjacent” driveway by getting rid of a lilac bush and a bunch of grass and covering it with some asphalt that doesn’t remotely match the rest of the driveway. It also goes right up to the foundation of the neighboring house, causing drainage, snow, and ice issues. 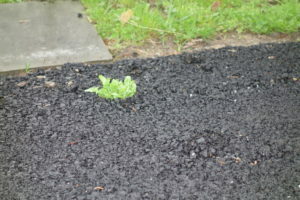 Well, just a few months later, the weeds from the paved-over lawn are poking through the asphalt. One weed’s already poking out, and there are several spots where it’s buckling. I am taking malicious pleasure in this. There is nothing I love more than when my kids are happily hanging out with each other. They’ve been going on long biking adventures lately, and even though a teensy part of me is fretting that they have been abducted, I am mostly thrilled. Now that it’s spring and we have some windows open, one of my favorite things is walking into my bathroom and hearing the girls giggling with each other from where they’re sharing a hammock below. Happy Mother’s Day, Katie. You’re a wonderful mom. Having your girls share an enjoyable time is the best gift ever. Happy Mother’s Day! As always, you make me laugh, not just a chuckle, but a snort and spit out my coffee laugh. I thank you for that! You are one of my mom role models. Enjoy your day. I found this blog as I was searching for things to do with my daughter when we come to Schenectady in a couple of weeks. My family is relocating to the area in the fall and we’re coming to house hunt. I’m a freelance writer, too. I thought you might be able to give me some hints and advice about the area? We’re coming from TN and have never been there before. Welcome to the neighborhood, Allison! I am happy to chat about the area with you, but fair warning: last time someone contacted me via blog on a similar mission, she ended up a short walk away from me, so understand that I have a big neighborhood bias. I’ll shoot you an email.